Have you ever wanted to be immersed in a gothic world where you're surrounded by elusive vampires, dangerous witches, and forbidden love? Does the story of deadly romance get you enticed by one of the best new slots game that has just that? 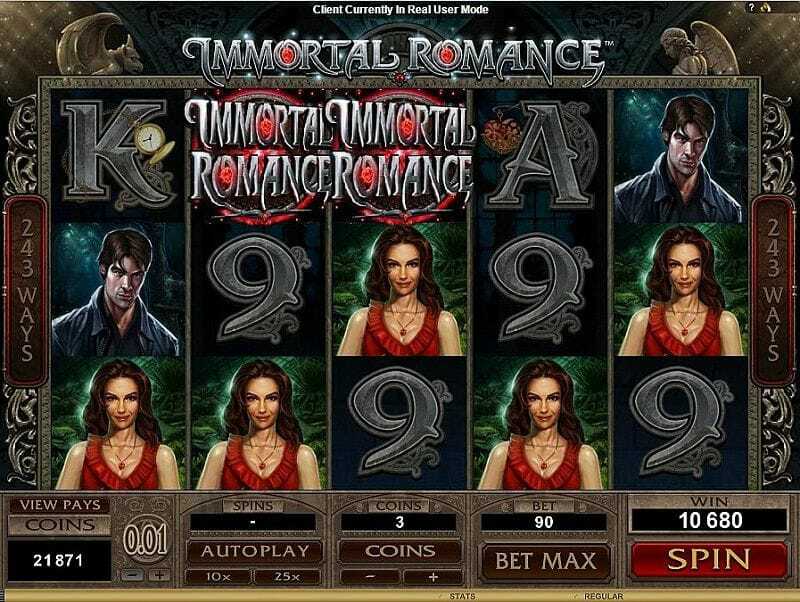 You'll be excited to hear that the iconic Microgaming has released a dark yet sultry online slots game that's filled with all of the features and twists that you need in a game, Immortal Romance. If you're familiar with movies and TV shows like Twilight, True Blood, and the Vampire Diaries, then you can expect Immortal Romance to give you the entertainment and satisfaction that you search for in those drama series. If you love promo's don't forget to check out our top casino promotions. Many experienced casino game players would tell you a lot of great reviews about the games that Microgaming has created over the years. They've been around since 1994, so they know exactly how to make each of their games as readable and exciting in order to attract new players, as well as retain their existing ones. And just because they've been around for over 2 decades, it doesn't mean that their products are ancient. All of the games that they developed are adaptable to almost every device that many of us use today. If you're not familiar with the developer's name but have played many of their other games like Cops and Robbers, Dragon Lady, and Victorian Villain, then you can rest assured that Immortal Romance is just as exciting and legible as their previous products! The gameboard is simple enough to read and place bets on with its 5 reels spread across the screen. but Immortal Romance slot has a wide range of BONUS FEATURES and rounds that would keep any player on their tiptoes. The features themselves are just as complex as the romance twists that you'd recognise in the Gothic vampire romance films that you watch today. However, they don't complicate the gameplay and gives the players a large number of routes to go down to make big winnings, with the help of the WILDS and SCATTERS that can appear on your reels. Golden Lion Door Knocker SCATTER: Activates the Chamber of Spins BONUS FEATURE when 3 of these symbols appeared on the reels. 10 free spins and a multiplier of 5 gets added to your winnings. Chamber of Spins BONUS FEATURE: Unlike most of the other slot games, this features gives out rewards depending on how long the player stays on the game. There are 4 different types of rounds that you can choose from this feature. Amber Feature: Triggered when you activate the free spin for the 1st time, the player receives a 5x multiplier along with a re-spin. 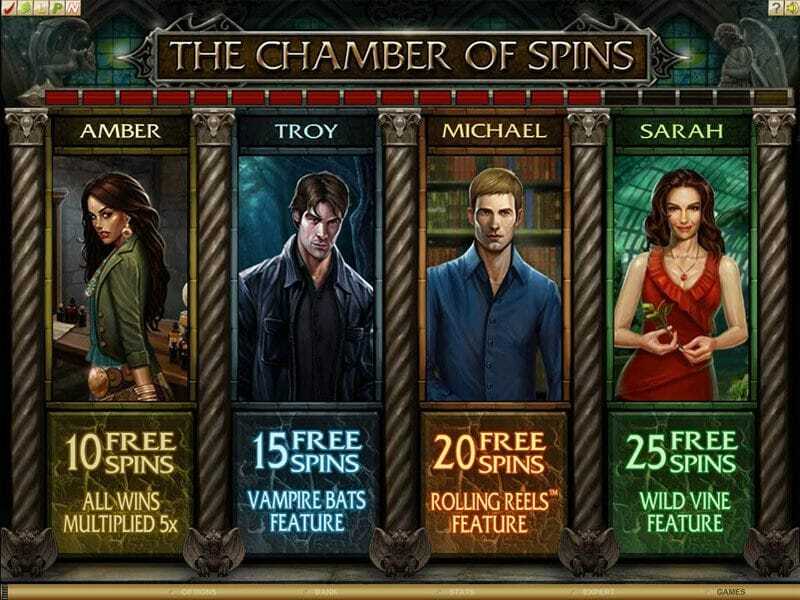 Troy Feature: Triggered when you activate the free spin for the 5th time, the player receives a Vampire Bat function that turns current symbols into multipliers and WILDS, along with another 6x multiplier. Michael Feature: Triggered when you activate the free spin for the 10th time, the player receives 20 free spins with rolling spins. A 5x can be earned on each spin. Sarah Feature: Triggered when you activate the free spin for the 15th time, the player receives 25 free spins and a special 'WILD wine' symbol on the 3rd wheel that replaces any other symbols and turn them into WILDS. 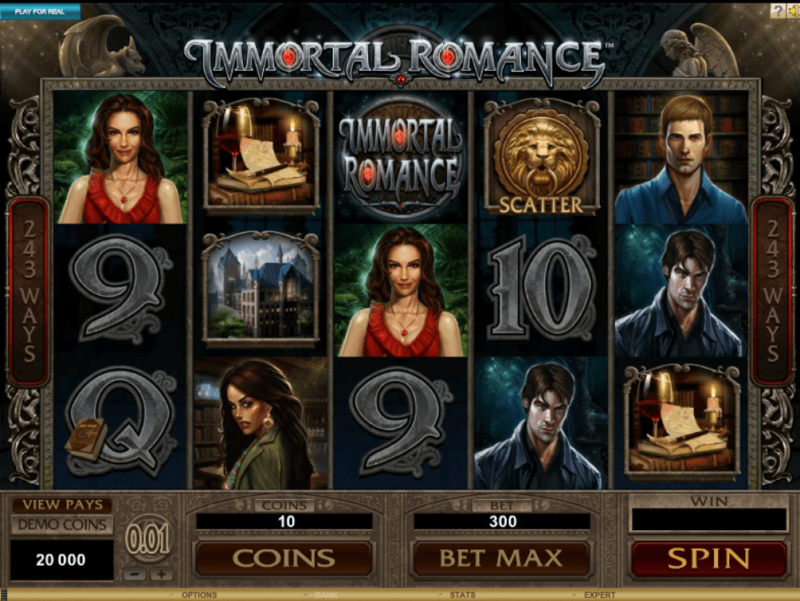 From all of the reviews from other casino gamers, Immortal Romance is certainly one that you cannot draw away from. The number of features that this slot game has literally made you play the game for hours on end. With the big twist of rewarding players for the time they'd spend on it, Microgaming has made this game unique in comparison to the other slots that you'd have played in any casino online. And with it's high RTP rate of over 95%, who could resist the vampire's charm? If you enjoyed Immortal Romance slot then you might also like Irish Luck.